What Do You Think Of? 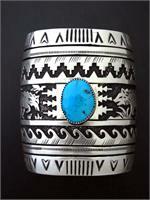 Most people probably visualize lots of ornate silver with turquoise when they think about Native American tribal jewelry. Surprisingly, North American Indian artisans did not start using this style until the 1800’s when they learned it from the Spaniards. It was not initially Native American at all, even though today many Indian tribal jewelry artisans fully embrace it. Native Americans certainly wore jewelry before the arrival of the Europeans. In alignment with nature, they used the natural materials to make meaningful ornaments and beads. With their primitive tools, the process was a pain staking and time-consuming process. They meticulously handcrafted each bead from antler, shell, horn, bone, quills, feathers, claws, teeth, wood, and stone. These components provided the wearer with a spiritual connection to nature – and spirituality is a defining characteristic of all Native American cultures. Except for the unique copper jewelry of the Great Lakes region, most of this early Native American tribal jewelry did not survive. Only a few isolated stone beads remain. Things changed when the Europeans arrived. They brought trade with them – and trade meant a steady supply of colorful, uniform, and plentiful glass beads. Native American crafts of all kinds- especially textiles and tribal jewelry suddenly acquired a new aesthetic. Despite these changes, Native American artisans continued to integrate traditional symbols into their work. The exact symbolic meaning varied from tribe to tribe, but is enlightening nonetheless. For example, the bear was considered a cosmic guardian and fierce protector by many tribes people. Birds carried prayers to heaven – especially the spirit bird depicted in flight. Kokopeli playing a flute assured the tribe of crops and babies. The three sisters – corn, beans, and squash – gave both spiritual and physical nourishment. These are just a few of the repeating symbols that continue to embellish Native American tribal jewelry even today. Send your comments and suggestions…I would love to hear from you! Turquoise is one of the most prevalent stones used in Native American jewelry. Dating back to thousands of years ago, Native American tribes mined turquoise stones as they believed that it was a sacred stone. They designed masks and other accessories to decorate themselves with this amazing stone. In the 19th century, Spaniards taught Navajo American Indians to construct the turquoise and silver jewelry that remains their trademark today. 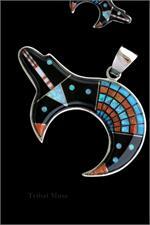 The color of turquoise, to the Navajo tribe, symbolized luck, happiness and health. These qualities led to the use of turquoise in many different aspects of Native American life for attracting luck and good fortune. Simple beads dating from around 7,000 BCE are among the first forms of jewelry found in the archaeological record from any Native American tribe. Originally, these beads were made out of shells or rocks. Over time, colorful stones and ornate construction gained favor, especially for tribal celebrations. Even during combat, Native American warriors wore impressive jewelry to show their superiority to the other tribes. If you are looking to purchase certified Native American Indian Jewelry in Turquoise and Silver, visit us at TribalMuse.com. 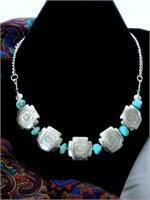 Our Jewelry was handcrafted by Navajo, Santo Domingo, and Zuni silversmiths. The artisan’s Hallmark (stylized signature) is on each piece. 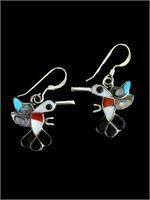 You might like our Southwestern Jewelry too.